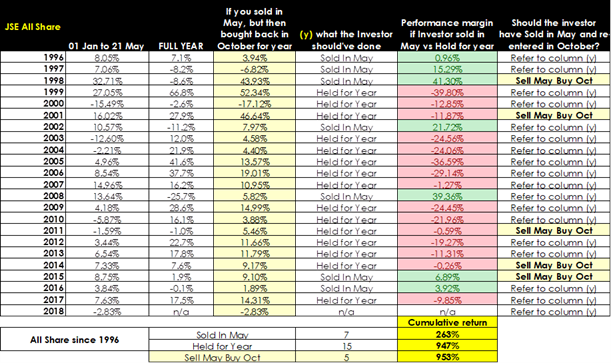 Home Instruments & Investments Sell in May and go away? The old stock exchange saying “Sell in May and go away” came about in the golden days of the stock market in London, where the phrase originally used to be: “Sell in May and go away, and come on back on St. Leger’s Day (a famous horse race held annually in September)”. The saying arose when London’s wealthy, namely the nobility, bankers and other prominent traders and merchants fled the city during the warmer summer months. Trade would dip due to less volume and activity going through the market, while trade action on the general market would become a bit more volatile. In the past, this premise may have been roughly true for the UK and the US – most Americans will take their summer vacations between Memorial Day (the last Monday of May) and Labor Day (the first Monday in September) – but the relationship has not really been evident since about 2010. More recently, the foreign markets have been misleadingly tricky to navigate, actually sometimes yielding material returns during the months that the adage suggests one should be out of the market. The adage generally has never really held true in South Africa as can be seen from Tables 1 and 2. In fact, adhering to the strategy of selling at the end of May and reinvesting again in January, rather than adopting a simple buy-and-hold strategy, would have left one seriously worse off financially. This would make sense, given that we are very different nations culturally, and that our holiday periods fall during different times of the year compared to the UK and US. 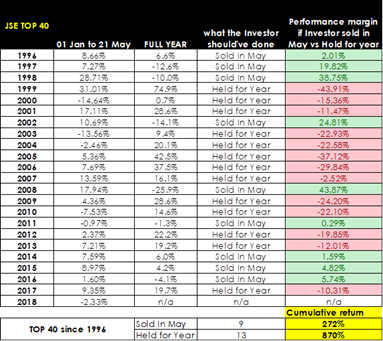 Table 1 shows the returns that an investor in the JSE Top 40 Index would have achieved since 1996 if they had opted for the Sell-in-May strategy compared to holding the index for the entire year. The former strategy was superior in only nine of the 23 years whereas the latter strategy yielded better results in 13 of the years (it’s obviously too early to judge for 2018). But the real difference can be seen in the cumulative returns: an investor who sold in May each year and went back into the market at the end of the year would have seen a 272% cumulative return; one who adopted a buy-and-hold strategy would have enjoyed a massive 870% cumulative return. 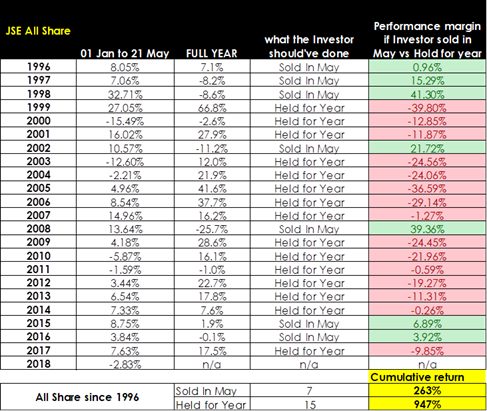 Table 2 shows the same return statistics for the JSE All Share Index. Unsurprisingly, the outcome is rather similar with the Sell-in-May strategy outperforming in seven years and the buy-and-hold strategy delivering better results in 15 of the years. 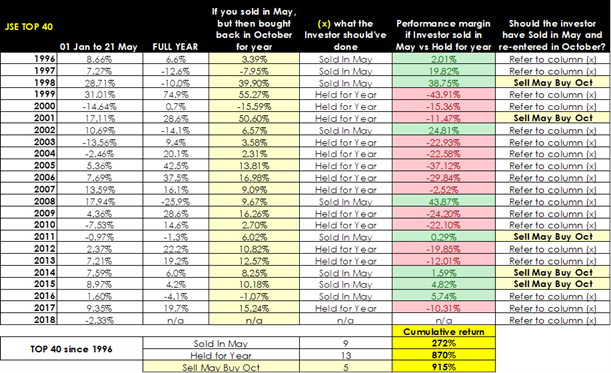 The cumulative performance is even more skewed to simply holding the index for the entire period: selling in May resulted in a cumulative return of 263%, while holding the index for the entire period would have seen an enormous 947% return. It is quite evident that the “Sell in May and go away” strategy does not hold true in South Africa. And these figures do not even take trading costs or potential Capital Gains Tax (CGT) into account which would result in an even worse return. We then wondered whether opting out of the market for just the quieter May to September period might have worked in the South African environment. The results are shown in Tables 3 and 4. And the numbers are quite surprising. The revised strategy would have yielded the top annual return in only five of the 23 years under consideration. However – and this is a big however – the bulk of SA’s returns would appear to have been achieved during the warmer months, and so by selling in May and buying again in October, an investor would be able to earn better returns than by simply holding the stocks for the entire period. 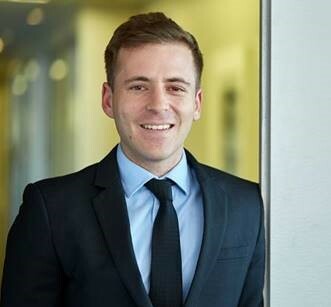 This holds true for both the JSE Top 40 Index, which saw a cumulative return of 915%, as well as for the JSE ALSI, with a cumulative return of 953%. The improvement in performance is even more pronounced in the case of the Top 40 Index, with the caveat that these calculations do not take trading costs or tax into account. 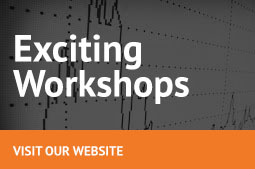 Previous articlePrivate equity in South Africa – changes for growth?